Practice or race video, in-depth race analysis between prelims and finals, or help with a specific technique, our e-Swim Technology is right there, always available, at your convenience, anywhere in the world. We are the first swimming sports performance service that provides an online interactive web meeting place to connect with you one-on-one any time you need it. Developed to optimize your potential, all the services on this site come with FREE online meetings to maximize your investment on improvement. Reduce Drag - Add Power – Lower Energy Cost Identify Correct Stroke Tempo – Enhance Streamline Techniques ”All swimmers achieve their velocity from technique in distinctly different ways, and the differences are as unique as a fingerprint.” Go to your next practice armed with objective technique information, not guesswork. Any destination world wide is possible. Individual or group testing available. Be the organizer of a testing session in your community, and your testing is completely free! One of the best features of our Velocity Meter/Video Telemetry, identifies the best tempo you should use for any distance or event. Make daily practice more meaningful, by adding precision to swimming the correct tempo and distance per stroke. Especially beneficial for swimmers/triathlets that sometimes train without a coach, we give you all the tools needed to improve. 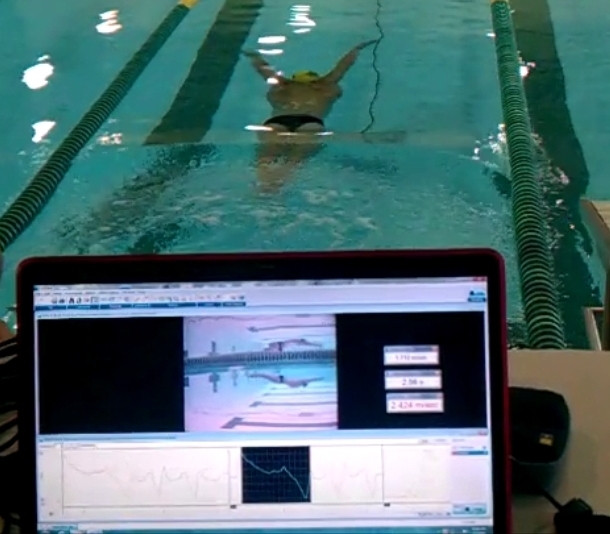 Coaches around the country that have used this method have regularly produced swimmers to the U.S. Olympic Trails. All the competitive strokes can be measured and applied to short or long course swimming, and is especially beneficial for open water comeptitiors. We will give you the same race analysis you can see on many websites of World Champions and Olympians. You can take your results, and see how you stack up against the best in the world, and identify what you might need to improve to get to that elite level. We can even give you performance suggestions...if you like...that can help you get the most out of all your races. The Only Thing We Sell . . . Is Improvement!